You might have a friend who wouldn’t be caught dead in the same outfit twice. But what’s the real cost of fast fashion - the buy it, wear it once, throw it away culture of cheap clothing that has hit the mainstream? Not dissimilar to the fast-food movement, fast fashion is about getting the latest trends from the catwalks to the stores in the shortest time possible and at the lowest price. Pioneered by retailers such as Zara, H&M, Uniqlo, Gap, Forever 21 and Topshop, fast fashion is challenging the standard fashion industry cycle of introducing new clothes on a seasonal basis1. The emergence of fast fashion has also been fueled by the rise of social media influencers, leading young women, in particular, to adopt a new way of consuming clothes – 25% of 14-to-17 year olds and 13% of 18-to-24 year olds say they’re buying more clothing than they were a year ago2. The appeal is that the products are cheap, trendy and often, limited in number. But the financial downside is that to stay on trend, you need to buy more items more often. One survey found that 21% of respondents estimate that they own over 100 items of clothing (excluding underwear or accessories)3. Millennials (16-34 year olds) have the highest proportion of new clothing; 38% of millennials say they have purchased at least half of the clothes that they own in the past year, while just 9% of baby boomers (over 55s) have done the same4. And fast fashion also has other costs. Workers’ rights, including fair pay and safe working conditions, are often sacrificed in order to provide clothes at the possible lowest price5. Firstly, there are the immediate environmental impacts. Clothing fibres, such as non-organic cotton, require large amounts of water, plus pesticides and fertilisers, to grow6. And, further along the production line, huge amounts of water are used to dye clothes, with the water - polluted with bleaches, acids, dyes and inks - contaminating local waterways in developing countries, where the majority of clothes are produced7. And secondly, the disposable nature of fast-fashion means that more and more clothes are being thrown into landfill. Amazingly almost a quarter of Australians admit they’ve thrown away an item of clothing after wearing it just once, while 41% say they’re thrown unwanted clothes straight in the bin8. If you’re concerned about the impacts of fast fashion both from a budget and environmental point of view, why not be part of the solution, not the problem? Below are a few things you can do to help. We’ve provided a checklist to use the next time you’re thinking about shopping for a fresh new look. Do I need to buy new? Consider secondhand stores or websites when shopping. Aside from snagging pre-loved bargains, some retailers even donate their slightly damaged goods (think missing buttons or make up stains) to these stores so you can actually find brand new clothes. And if you want to stand out from the crowd with a look that’s unique, where better than secondhand to find a fabulous one-off piece or rock a vintage look. Polyester, nylon and other plastic-based synthetics take a long time to break down in landfill while cotton farming is very water and pesticide intensive. Organic cotton, tencel, hemp, bamboo, linen, silk and wool are better choices9. If you’re used to buying four or five new items at an average of $50 per item every month, instead consider pooling that cash and spending $200-$250 on one quality item that you can wear season after season. You can do this via online ethical marketplaces such as Well Made Clothes or Sustainable Fashion, while most major retailers also list their approach to ethics and sustainability on their websites. It may take a little more legwork, but your conscience will thank you. You can also help by thinking carefully about when and how you dispose of clothes and avoiding landfill where possible. 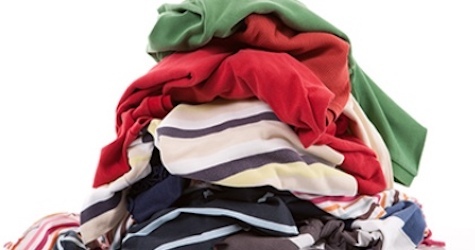 Here’s another checklist to consider when you’re doing a wardrobe clean out. Instead of simply throwing away damaged clothing consider whether you can mend it, or if you’re not handy, have it fixed. If it can’t be returned to its original condition, perhaps you can embrace the visible mending approach and create an item that is totally unique by adding your own spin on it when repairing. Would someone else love it? Perhaps your trash could be someone else’s treasure, so consider whether the item could be passed on to younger siblings or family friends, sold secondhand via websites such as eBay or Gumtree, or traded at a clothes swap event. Can it be donated to charity? While in theory, donating to secondhand stores (especially those that support charities) is a great idea, with 82% of Australians donating to charity stores but only 53% buying from them, there’s an obvious mismatch in supply and demand10. Fast fashion donations have added to the problem, with charities reporting that the quality of the clothing received is often so poor it has little or no value, and then then have to pay for its disposal11. So, ask yourself if the item is really in good enough condition to be re-sold before donating. Some large retailers are now looking to close the loop they’ve created through fast fashion. For example, H&M offers in-store recycling where used clothes (in any condition, from any brand) can be returned in exchange for a H&M discount voucher. They are then either re-sold as secondhand, made into new clothing or turned into other textile products such as cleaning cloths and fibres for insulation. Zara have introduced a similar scheme, however it’s not yet available in Australia. 1 Investopedia, Fast Fashion, paragraph 1, 5. 2 War on Waste Survey, Understanding Australia’s waste attitudes and behaviours, pg. 24. 3, YouGov, Fast fashion: Three in ten Aussies have thrown away clothing after wearing it just once, 2017, paragraph 5. 4 YouGov, Fast fashion: Three in ten Aussies have thrown away clothing after wearing it just once, 2017, paragraph 6. 5 Oxfam Australia, What she makes: Power and poverty in the fashion industry, 2017, pg. 6, paragraph 7. 6 McKinsey & Company, Style that’s sustainable: A new fast-fashion formula, 2016, paragraph 7. 7 Yale School of Forestry and Environmental Studies, Can waterless dyeing processes clean up the clothing industry?2014, paragraph 1, 8. 8 YouGov, Fast fashion: Three in ten Aussies have thrown away clothing after wearing it just once, 2017, paragraph 4,9. 9 The Green Hub, Sustainable fashion – a quick guide to eco-friendly fabrics, 2017. 10, 11 War on Waste Survey, Understanding Australia’s waste attitudes and behaviours, pg. 16.